At InspireTech, we believe in empowering our customers with the right tools to achieve your communication needs. You can always put a header or footer on the SMS with your organisation’s name as sign-off so the recipient knows where your SMS is coming from. We have observed some recipients asking “Who are you?”, “Where is this?” after receiving broadcast from our clients. Add either a header or footer. Just go to Edit Profile and type in either on header or footer with your organisation name or abbreviation which you think your recipients can identify with. For every SMS sent out, this will automatically put in front or at the back of the message. However, we need to highlight the limitation on the SMS message count. If you have set any header or footer, the SMS count does not include that, and you must remember to take note of the characters added. If it takes up 5 characters, remember to budget it into the SMS count as the program will not count header or footer at the point of creating your SMS message. Put <adv> in front of SMS messages which are advertising in nature. However, if you are sending to your organization members, you may be exempted. To avoid misunderstanding, especially from members who refuse to receive messages from you, do check your Inbox & Admin>App Inbox each time you login for replies which tells you “Remove me.”, “Stop sending me.”, etc. Turn on the “Notify me when there is incoming SMS” option in your Profile and make sure your email address is correct so the program can forward you any incoming SMS which is directed at you. ​3. Provide channel for unsubscribe. In your outgoing SMS, it is good to end with a statement like Reply UNSUB to unsubscribe. This is very applicable for organisations which are sending out promotional and marketing oriented messages. You can always use our automatic unsubscribe feature to manage unsubscribe request if you do not wish to manually manage the list. Go to the Admin>Manage Application Settings and turn on the Unsubscribe feature. 4. Update your mailing list regularly. 5. Avoid late hours messaging. We have noticed that people get very annoyed receiving an SMS late in the night even if the messages are well-meaning reminders and notices. We would discourage customers from sending out SMS after 9 or 10pm as most recipients dislike being disturbed during their sleep. If your broadcast list is huge and potentially the broadcast may flow into later hours (the average sending speed is about 600 SMS per hour), you can use our Operating Hours setting in Admin>Manage Application Settings. Set the OperatingFrom to 0800 and OperatingTo to 2100. When you set that, the system will stop sending out SMS between 2100 – 0759. This means even if you try to send SMS at 10pm, you’ll see the messages still get stored in the Outbox. The messages will only start going out at 0800 the next day. How to broadcast more messages at lower cost? Your recipients must first download our RapidSMS App (FREE) before you can send documents or FREE messages to them. Once you have downloaded the app, launch it then follow the steps in the app to verify your phone number. RapidSMS have done the groundwork of gathering feedback on effective communication between parents and the school. In this guide, we will share how the school can send a message to reach the heart of these parents who has children in primary to secondary schools. RapidSMS.net blog by InspireTech. The one-stop SMS solutions provider that offers simple and hassle-free messaging abilities to meet your organization's needs. 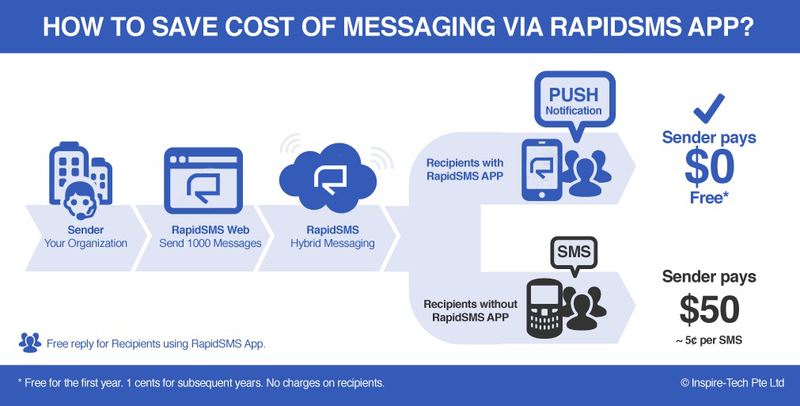 Stay tuned to this blog as RapidSMS shares the best resource to get the most out of your messaging campaign.